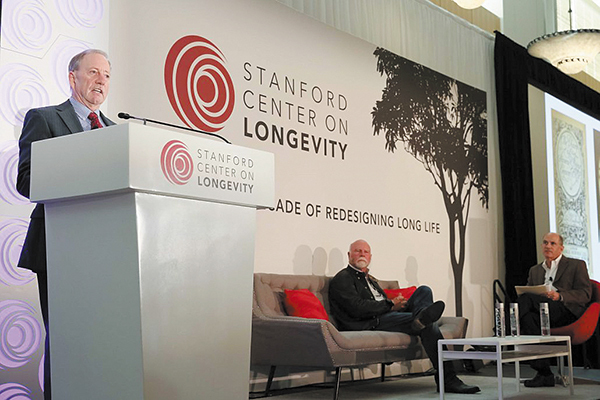 Steven Austad, PhD spoke at the Stanford Center on Longevity's 10th Anniversary Conference. Science is showing that while chronological aging is inevitable, biological aging is malleable. This idea began in 1988 when Tom Johnson and David Friedman published a paper in Genetics demonstrating that mutating one gene (age-1) in the worm C. elegans extended the worms' lifespan by 40 percent. This demonstrated for the first time that longevity can be affected by a single gene, and it was the launch point for an entirely new field, the science of aging research. From a modest beginning, in which scientists faced a heavy dose of skepticism, aging research has evolved into a dynamic field, one with the potential to change the course of human health, as aging damage has been identified as the common denominator for a myriad of chronic illnesses from dementia to cardiovascular disease, and certain cancers. One of the foremost scientists in the field of aging research is located here in Birmingham: Steven Austad, PhD, UAB Department of Biology Chair. "In the past year, research has moved rapidly into human trials," Austad said. He is involved with the TAME, Targeting Aging with Metformin, trial. Metformin, which was been prescribed for diabetes for 60 years, has also demonstrated protective effects against several age-related diseases. The TAME study has been approved by the FDA. "When we met with the FDA about this trial, we focused on the drug preventing cancer, heart disease and dementia, rather than on aging in general, because we can measure these metrics," Austad said. The next step, which the TAME researchers are currently working on, is to receive National Institute of Health funding. If funding is approved, UAB will be one of 14 centers conducting the study. "This is a six-year project," Austad said. "We plan to start with people age 65 to 80 who have a few health issues, and see if Metformin use can delay any further problems. "Metformin has been used for a long time with no serious side effects. It's extremely safe. That's why we settled on this as the first drug to try. It's not because it shows the most promise, although it shows a great deal. Rather, it's safe and we want to focus on FDA. You don't need FDA approval for Metformin. It's already approved. It's used all the time. But we want to use this to start a pathway for other, maybe more effective drugs, that are likely to follow. "If we can show that the FDA will approve a drug for aging, essentially, in a reasonable time, that will get the pharmaceutical companies interested in working on other compounds." For example, Rapamycin, which has been used with transplant patients, has shown to lengthen the lives of old mice by nine to 14 per cent. Some observers have concerns about Rapamycin, saying that it suppresses the immune system. "Actually," Austad said, "it is an immunomodulator. It boosts immune response if given at the proper dose. It got a reputation as an immune suppressant because it's given as part of a three-drug cocktail for kidney transplants and always to people who are very sick. But if you are healthy, it appears to be quite remarkable. It affects everything from the brain, Alzheimer's, to muscle strength. "In fact, we have found that when older mice are given Rapamycin before receiving a flu vaccine, they have a response like a young mouse. That's been replicated in people. So it wouldn't surprise me if, in the future, older people take Rapamycin before getting their flu shots." One of the hottest areas in aging research involves clearing senescent cells. Scientists have found that these cells, which are no longer capable of dividing, accumulate in aging organs, and eliminating them can alleviate, or even prevent, certain illnesses. In the past year, researchers have shown that clearing senescent cells in mice has restored fitness, fur density and kidney function. It has also improved lung disease and even mended damaged cartilage. And in a 2016 study, it seemed to extend the lifespan of mice. The Mayo clinic is beginning human trials in which they hope to treat osteoporosis by clearing senescent cells. "They are starting with two drugs that work well together," said Austad who is on the Mayo Clinic's external advisory board. "They use a combination of dasatinib, a drug that promotes cancer cell death, and quercetin, an antioxidant found in apples and other foods. They think this may treat a whole range of diseases." Unity Biotechnology, a company that Jeff Bezos of Amazon has invested in, is currently one of the leaders in senescent cell therapy. Like other researchers, Unity approaches the FDA with studies for specific disease, rather than general aging. They are currently in phase 1 trials for treating osteoarthritis, and planning trials in a number of ophthalmologic and pulmonary conditions. "We are finding drugs that can clear senescent cells without damaging surrounding cells because senescent cells have certain markers on their surface that we target," Austad said. "Researchers found these drugs by using massive screens where you mix regular cells and senescent cells together and then treat them all with the drug and look for the drugs in which the senescent cells dies and the regular cells don't. There are at least three drugs that have been identified that are about to start human trials. Those are ones they talk about. My guess is they probably have others they're not talking about." And why do senescent cells contribute to biological aging? "That used to be a puzzle because, even in people 100 years old, there are relatively few senescent cells," Austad said. "For one percent of your total cells to be senescent cells would be a lot. So people used to wonder how they could be bad for you when there were so few. It turns out that when cells become senescent, they start secreting a lot of molecules that damage the surrounding tissue, so they affect a much larger area than just where they are located." The leaders of the Buck Institute, the preeminent non-profit focused on aging research, say that they believe it is possible for people to enjoy their lives at 95 as much as they do at 25. That is a remarkable statement, something that just a few years ago would sound like hocus-pocus hyperbole. But research is moving faster than anyone could have expected, making this sci-fi dream a possible reality.